The Congressional Budget Office released its latest projections for the budget and the economy for the next 10 years. This is non-partisan analysis which is why it has a lot of credibility; politicians love to cite it if the CBO’s analysis on their proposals is positive. 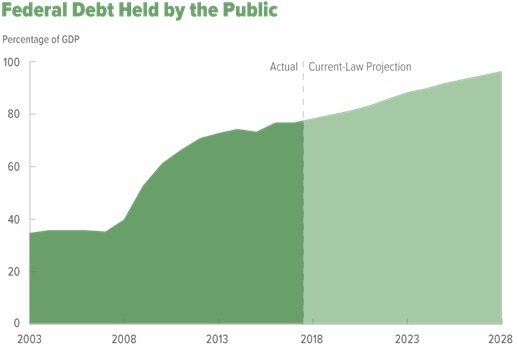 The headline of this report is that the federal debt held by the public as a percentage of GDP is expected to hit 96% in 2028. The CBO has been predicting a continuation of the heightened debt to GDP ratio seen in the chart below for a few years. This latest report is special because it includes projections made about the latest spending plan and Trump’s tax cut. We’ll take a look at some analysis on the tax cut which explains why some families haven’t made a dramatic change in their spending habits. There are some economists who believe the debt isn’t a big deal. This philosophy on debt and deficits has been supported by the fact that there haven’t been clear tangible negative effects of the high debt yet. The U.S. government has been supported by low interest rates. The interest payments are the most distinguishable part of the budget which show how the high debt is hurting the country. If interest rates increase and the interest payments on the debt grows exponentially because the debt is increasing, other important functions of government will have their budgets squeezed, not to mention the increased burden placed upon tax payers. Modern Monetary theorists purport that unlimited deficits can be run, but these high deficits would be a strong signal that the private sector couldn’t survive without extreme help from government (tax payer) sponsored bailouts. The current mixed economy can’t run without a strong private sector. Printing currency to pay the interest on the debt would cause significant price inflation; it’s a much different situation than QE which didn’t spike the M2 monetary supply because the money put into the system when the Fed purchased government and mortgage bonds was hoarded by the banks to improve their balance sheets. QE was a monetary policy aimed at stabilizing the financial system. Printing currency to pay back the debt would be a fiscal policy executed by the central bank. Thinking the government can create unlimited currency to pay for its expenditures because the Fed did QE is a fundamental misunderstanding of what QE is.